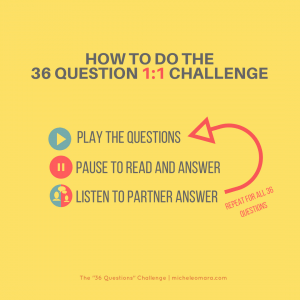 I consider the five love languages, described by Gary Chapman in his book, The Five Love Languages, to be essential reading for all couples. Yet, something is missing. 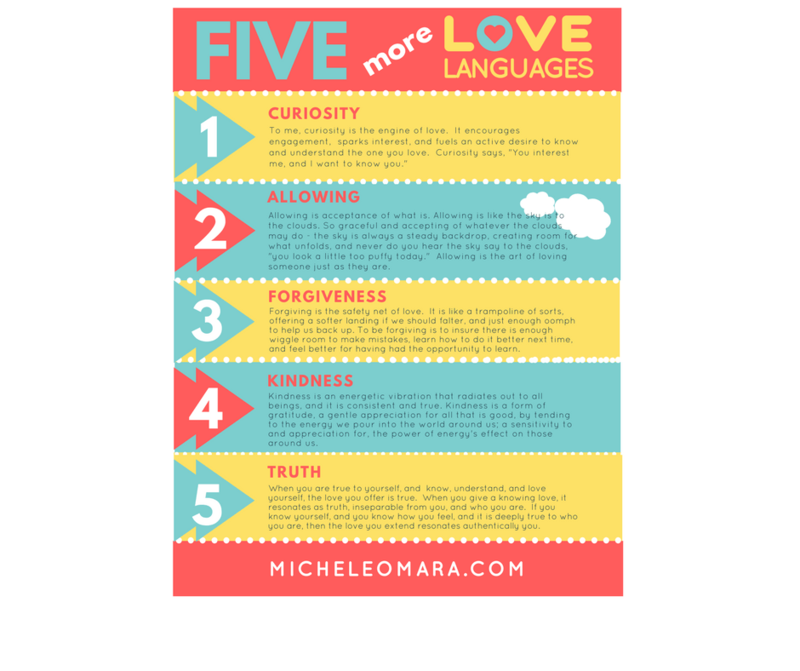 Read on to learn about five more languages that will help you communicate love. I am a big fan of the five love languages. I actually used these five languages to honor my dad’s life when I spoke at his funeral (which you can read about here), However, I am often left feeling like something is missing from this universally-used handbook for understanding how to communicate love in a way that works. 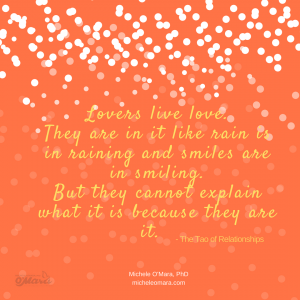 It’s as if the five love languages offer wonderful ingredients (touch, gifts, service, words and time) and even insights about how to recognize which ones to use, and when, but there is still something missing. Sometimes, you can speak the precise language your partner has taught you to speak, yet without the right dialect, it’s as if the message does not seem to register. It’s no different, I suppose, then having all of the right ingredients for the perfect dish, yet the end product will vary greatly, depending on how much of each ingredient you use, when and how you include them, the temperature and cooking technique used, and on and on. We can have all of our favorite foods, (or languages of love, in this case) but ultimately, it is a certain experience we are desiring – not the actual behavior. What we are most interested in is feeling a certain way, just as we want our food to taste a certain way. To simply touch her, talk to her, do things for her, spend time with her, or give her gifts – these feel like ingredients that are designed to create a feeling, to communicate love. Without the heat, the food isn’t cooked. Without patience or timing, the food can burn or be undercooked. Without balance, the taste can be overbearing or underwhelming. Just as, when we behave in certain ways, the separate ingredients used to communicate love, whether we touch, talk to, do for, give to, or be with her, we may need heat, we need spice, we need timing, patience, and balance. When I think about the most powerful language of love, I think of energy. Food is energy. People are energy. Love is energy. This energy is part of who we are. Therefore, the language of love has to do with how we treat, manage, hold, express and exchange this love-energy, and how we mix and blend this love-energy with the others. I posted a quote on social media recently with the quote that speaks to this, from a book called, The Tao of Relationships by Ray Grigg. I’ll include a fresh version here. Ultimately, we partner to feel a certain way. Because of this, I believe, rather than asking how to feel loved (by way of a particular behavior), it is first useful to understand what being loved actually feels like to you. 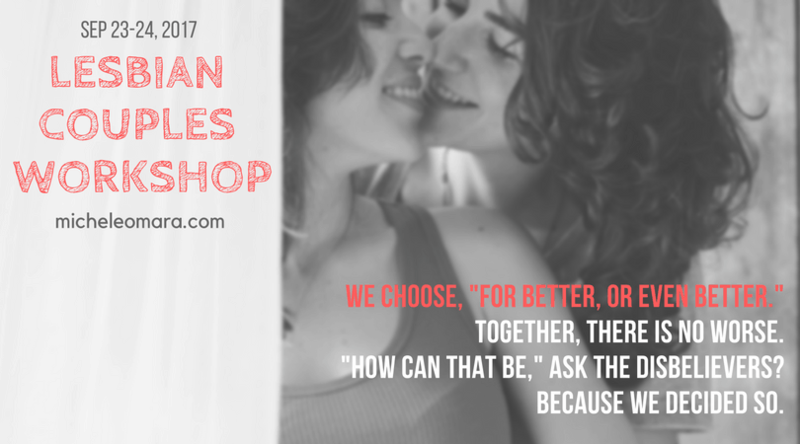 What is the feeling you hope to experience by being in love with another? It isn’t the action, the gift, the words, or the touch that we crave, it’s how we anticipate those things will make us feel that we desire. It isn’t the clean house, or the heartfelt card, or the passionate kiss, it’s the way these things make us feel. For example, I want to feel understood, accepted, alive, inspired, worthy, playful and connected. What makes me feel this way is not easily found in the five love languages. The ultimate way to feel love for me is less about these tangible things (words, gifts, time, service, and touch) and more about being known, sensing that she “get’s me,” and feeling accepted, and I need to experience the positive energetic and chemical connection that can only be felt, not described. The magic of love is that it’s experienced so intensely, it can inspire and fulfill dreams, create hope, give birth to, and save, lives, soothe the soul, and so much more. Yet we can not see it, the actual love itself – this powerful force, this indescribable ingredient. We only see what it can do. As with energy, we do not see the energy itself. We see the shape it takes and how it is used. I think if I were to write the book, 5 More Languages of Love, I would describe these languages as personality characteristics; these languages are a part of the person, not a thing they do. I would use the 5 Languages to describe the lover, the one who holds the energy of love, and how that love is experienced, expressed and grown. Because there is no one way to love or feel loved, we all end up being responsible for teaching others how to speak our unique language of love. After some thought, here is the dialect of my personal language of love. I hope by reading this, you are inspired to consider your own language, as well as the languages of those you love. For me, the most powerful love languages are less about what you do, and more about who you are, how you are, and the way you express the energy of love. Allowing creates the feeling of acceptance. Allowing is not permission to misbehave, it is permission to simply be who you are; all of who you are, without fear that you will be judged, criticized, rejected or otherwise disconnected because of who you are. Because we are human, we are certain to make mistakes. Forgiving is the safety net of love. It is like a trampoline of sorts, offering a kind landing if we should falter, and just enough oomph to help us back up. To be forgiving is to ensure there is enough wiggle room to make mistakes, learn how to do it better next time, and feel better for having had the opportunity to learn. The sentiment I am trying to capture here is hard to put into just one word – it’s probably a concept that does not yet have a word, and yet it’s one of the most important languages to me. I feel most loved when I am in a positive, kind, playful, environment with laughter, silliness, vulnerability, and ease. It’s an energy, for sure, and like love, it’s much easier to feel than it is to describe. There is some way that energy speaks louder than actions, and for me to feel love, that energy needs to be positive and kind. The one ingredient that seems to capture the essence of this part of love languages for me is a basic human kindness. Kindness is the sort of energetic vibration that radiates out to all beings, and it is consistent and true. Where there is kindness, oxygen seems to fill my lungs more easily, interactions go more smoothly. Kindness is a form of gratitude, a gentle appreciation for all that is good by tending to the energy we pour into the world around us; a sensitivity to and appreciation for, the power of our own energy’s effect on those around us. Kindness allows us to breathe in hopefully and exhale peacefully. To feel loved, I need to experience a sincere sense of kindness in the company of the one I love. It is not enough that I sense their kindness toward me; trusting this love means I see this same kindness directed to others. It is a way of being in the world, a part of who you are. For some, the sentiment I’m reaching for here is talked about in terms of loyalty, fidelity, honesty, or even commitment. While related, they are not the same. To me, the characteristic of being true means that you are true to yourself, that you know and understand and love yourself, TRUTH IS ABOUT AUTHENTICITY. In the words of Oriah Mountain Dreamer, “I want to know if you can disappoint another to be true to yourself.” When you are true to yourself, I know you can be true to me. The feeling this provides is safety and security. If you know yourself, and you know how you feel, and it is deeply true to who you are, then I can trust that when you extend your love to me, it is true. This gives me the feeling that, no matter what happens, I am safe with you. The emphasis isn’t on ensuring that you stay, or knowing that you’ll never lie to me. The emphasis is on knowing that you will live a life that is true to who you really are and that your first commitment is to you so that the you I think is loving me, is the you to whom you are most true.